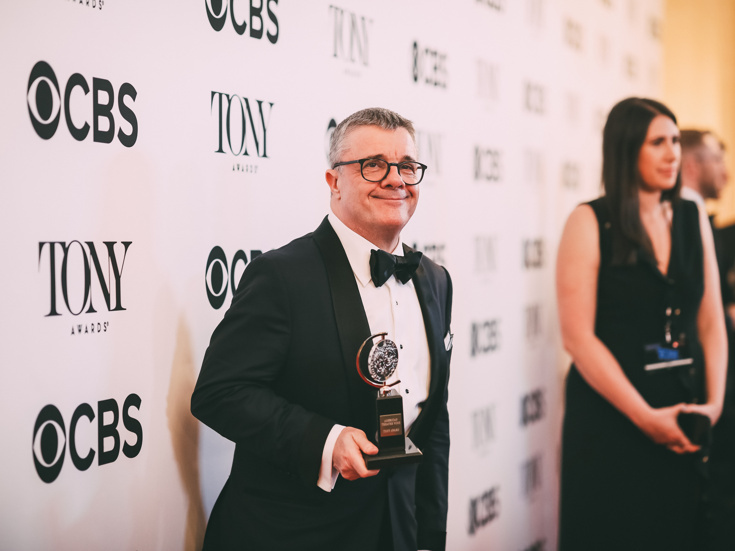 Broadway legend Nathan Lane has won his third Tony Award! His searing performance as Roy Cohn in Angels in America earned him the trophy for Best Performance by an Actor in a Featured Role in a Play. The win was announced at the 72nd Annual Tony Awards ceremony at Radio City Music Hall on June 10. Lane won over fellow nominees Michael Cera for Lobby Hero, Brian Tyree Henry for Lobby Hero, Anthony Boyle for Harry Potter and the Cursed Child and David Morse for The Iceman Cometh. "I thank all of our brilliant designers and the astonishing group of actors, dancers and puppeteers lead by the magnificent Andrew Garfield. It's an honor to share the stage with you," said Lane of his co-star, who also won a Tony for Best Leading Actor in a Musical. "This production wouldn't have been possible without the brilliant Marianne Elliott. I thank you for your kindness, your passion, your determination, your inspiration and your extraordinary vision. I want to thank Tony Kushner for being such an adorable genius. Even his emails are Pulitzer-worthy. I'm standing here because Tony wrote one of the greatest plays of the 20th century, and it is still speaking to us as powerfully as ever in the midst of such political insanity." He continued, getting teary and saying, "I'm a mess. To my dear husband, Devlin Elliott, the greatest blessing in my life. About eight years ago, I decided I needed to shake things up. I needed to scare myself again and challenge myself more because I felt I had more to offer as an actor. This performance has been the culmination of a lot of that work and this award is a lovely vote of confidence that I've been on the right path. Thank you very much." Tony Kushner's iconic two-part drama began performances of its first Broadway revival on February 23. Marianne Elliott directs the pair of works about the early years of AIDS—titled Millennium Approaches and Perestroika—which officially opened on March 25 at the Neil Simon Theatre. Returning to Broadway for the first time since its original production opened in 1993, this new staging had its world premiere in 2017 with London's National Theatre, where Lane also played the role of Roy Cohn. A Broadway luminary, he recently headlined the starry revival of the classic play The Front Page and received a 2017 Tony nomination for his performance. He has won Tony Awards for The Producers and A Funny Thing Happened on the Way to the Forum and picked up additional nominations for Guys & Dolls and The Nance. Other main-stem credits include It's Only a Play, The Addams Family, Butley, November, Waiting for Godot, The Odd Couple, The Frogs, Love! Valour! Compassion!, The Man Who Came to Dinner, Some Americans Abroad and Present Laughter. Hear Lane talk about taking on real-life lawyer and Donald Trump mentor Roy Cohn in Angels in America on Show People with Paul Wontorek. Check out this incredible footage of Nathan Lane, Andrew Garfield and more in Broadway's gripping Angels in America.